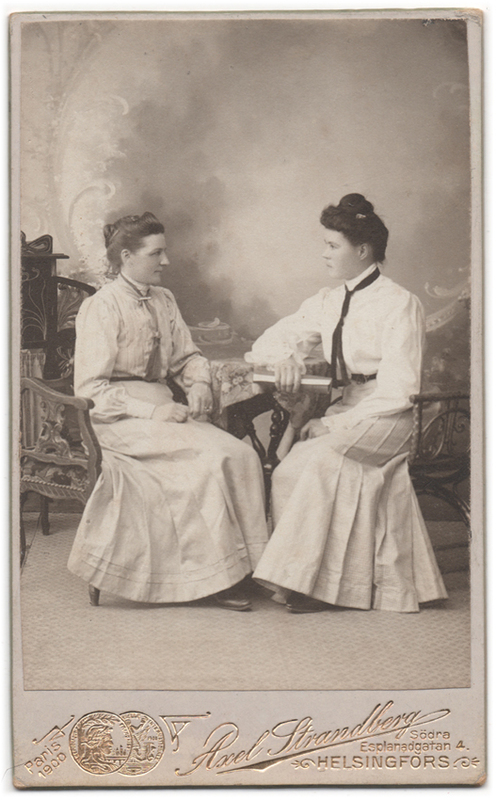 A photograph of two unidentified women sitting on opposite sides by a table, gazing at each other. The woman on the right is clutching a scrolled booklet in her hand. This, at least in my eyes, breaks the harmony of this otherwise so peaceful photograph. It adds tension to the image that makes me wonder if she’s angry at the other woman – quite possibly she wasn’t, and the impression is merely caused by my lack of skills at recognizing the emotions of others. The photograph has been taken by Axel Strandberg in Helsinki, Finland, sometime after the year 1900.